Do tradition, freedom, and marriage equality justify legalized polygamy? 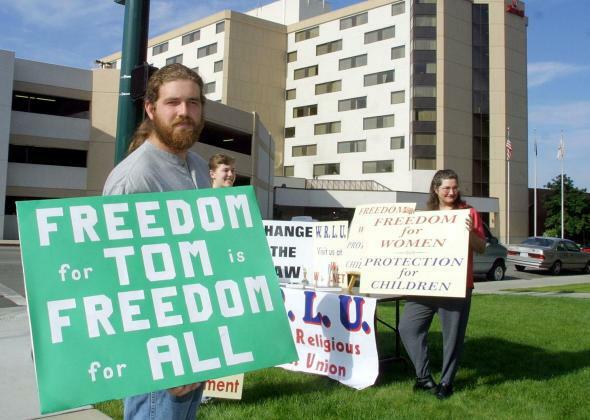 Protesters defending a U.S. polygamist in Provo, Utah, May 18, 2001. Americans are accustomed to a marriage debate between traditionalists and egalitarians. The traditionalists say marriage is the union of a man and a woman. The egalitarians say all marriages, gay or straight, should be treated the same. The egalitarians also ground their view in pluralism, arguing that the law should respect different ways of life. In other parts of the world, however, these ideas aren’t always at odds. Traditionalism, equality, and pluralism sometimes converge. But they don’t converge in the way Americans might expect. What they converge on is polygamy. Traditionalists are delighted with the new law. As Agence France-Presse explains, “polygamy is common among traditional communities in Kenya, as well as in the country’s Muslim community, which accounts for up to a fifth of the population.” In approving the legislation, lawmakers also quoted the Bible, citing King Solomon’s marriages. Each side in the U.S. marriage debate can claim that the Kenyan experience supports its views. American traditionalists have warned all along that gay marriage will lead to polygamy. Egalitarians can point out that Kenya’s embrace of polygamy actually coincides with a ruthless crackdown on homosexuality, underscoring the moral emptiness of appeals to tradition. But the real message from Kenya is that all the principles we invoke—tradition, equality, pluralism—are more complicated than we imagine. They go well beyond our favorite contexts, leading to results we may find repellent. Faced with those consequences, we can choose to accept them—embracing polygamy, for example. Or we can rethink the limits of our ideological commitments.